When cats are also bots. 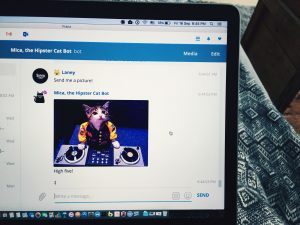 Earlier this year, Austrian developer Barbara Ondrisek (@electrobabe) released “Mica, the Hipster Cat Bot”, that makes sure you’ll find and meet your fellow hipsters in different cities and different countries around the world. Mica was launched on product hunt and experienced an unexpected hype. Reason enough to look into it, see what Mica is all about and why “she” is relevant. What is special about Mica? Mica conquered the hearts of the (Austrian) internet generation by storm. The users were fascinated by it’s simplicity, useful tips and short dialogues. And if you ask for it, Mica sends you cat content. 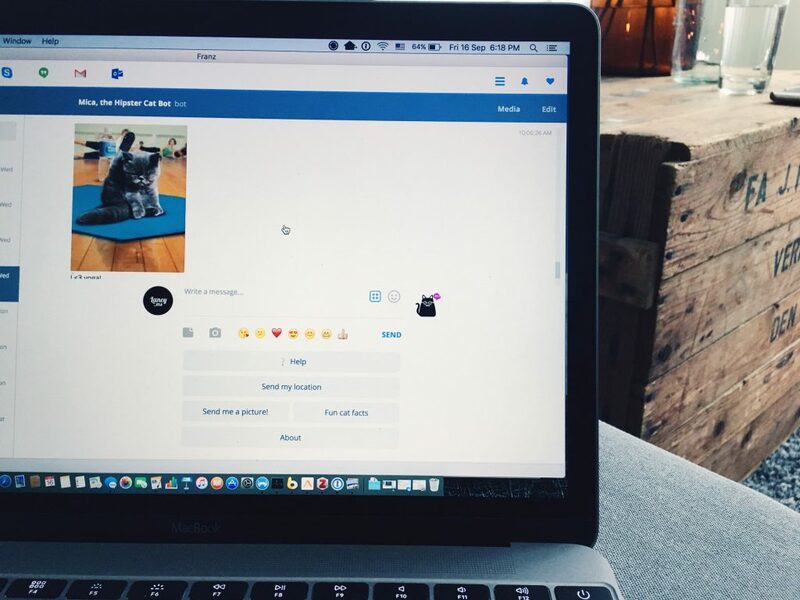 Originally designed for Facebook Messenger, it is now also available on Telegram and Skype. The bot was one of the first bots to receive global approvement by Facebook. Mica is easy to use with (at the moment) pretty basic functions. 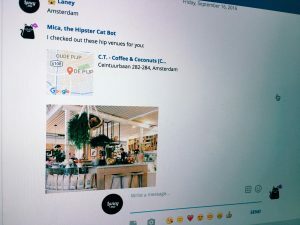 You can send her your location (or the city you’re interested in), and Mica replies with ‘hip’ suggestions of cafes and restaurants close to the location you sent. But how does Mica know what is hip? Well, we don’t know how Mica judges if places are ‘hip’ or not. What we do know is, that behind the cat works an algorithm. Barbara, the developer of Mica, explains it a little bit in a blogpost on her medium page: The algorithm is designed to look up hip places around the world. It looks up popular places, using different sources (Foursquare, Yelp, Google Places and Facebook Places), looking for “specific keywords, combines the results to find the best hip venues”, merges the data, and eventually makes it then visible through Mica. Why is Mica relevant, and why should I care about chatbots? With this happening, bots are a technology that are now at the entry point of mainstream and mass use. Will we be talking to chatbots? Chatbots are probably on the fast lane right now, since the place where we – the people – communicate has changed drastically. In the recent past we could observe three major trends, where communication on the internet experienced a shift or took a turn. Communication changed from websites to social media, then it shifted to apps on smartphones and now we’re experiencing a movement towards messenger applications. 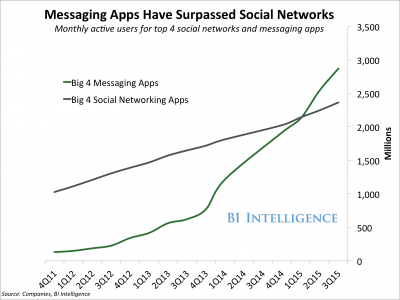 Chatbot Magazine argues that “for the first time ever people are using messenger apps more than they are using social networks.” Earlier this year, Business Insider published the chart below to visualize how the use of messenger apps is growing and how steep the development was over the past years. What bots are now able to do – besides delivering information – is what Bonne Chantarotwong calls “stimulating the conversation and entertain the users” (1). This might be another argument of why bots are becoming so popular. It is entertaining or at least not boring, the user can express him- or herself and a kind of one-to-one interaction is going on. Users are encouraged to speak with a bot. They can do it with their own words. At least to have a small conversation. This is also what Zadrozny et al. point out in their paper dealing with human-computer interaction: users basically want “to express their interest, wishes, or queries directly and naturally, by speaking, typing, and pointing” (117). Actions that are natural to them. Abu Shawar, Bayan and Atwell, Eric. “Chatbots: Are they Really Useful?”. LDV-Forum Band 22.1 (2007): 29-49. 16 September 2016. <http://media.dwds.de/jlcl/2007_Heft1/Bayan_Abu-Shawar_and_Eric_Atwell.pdf>. LoveBot chatting on behalf of human: Are we surrendering our social life to technology?